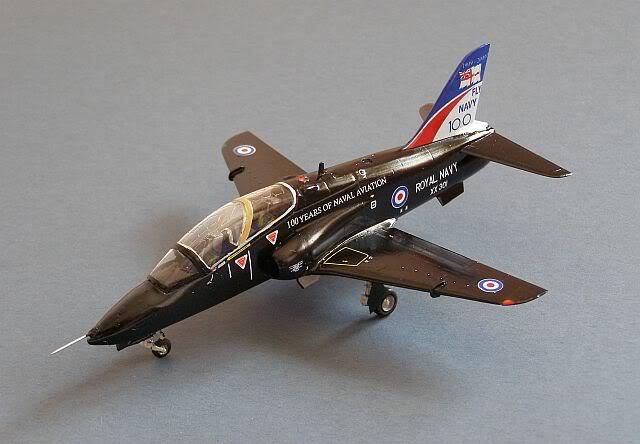 BAE SYSTEMS Hawk T.1 Royal Navy Display Aircraft - Fly Navy 100 - RNAS Yeovilton, 2009. 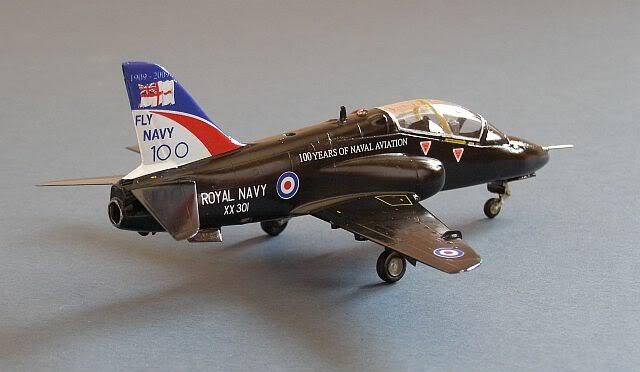 Adding a bit of colour to proceedings, and in keeping with this month's anniversary, this is an Italeri Hawk (actually the 100 series kit), with the excellent Alley Cat "100 Years of Naval Aviation" decals (which are beautifully printed and very reasonably priced!). I'm using the 100 series kit simply because there is one already in the stash (it was cheap) and the modifications should be quite simple (famous last words!). 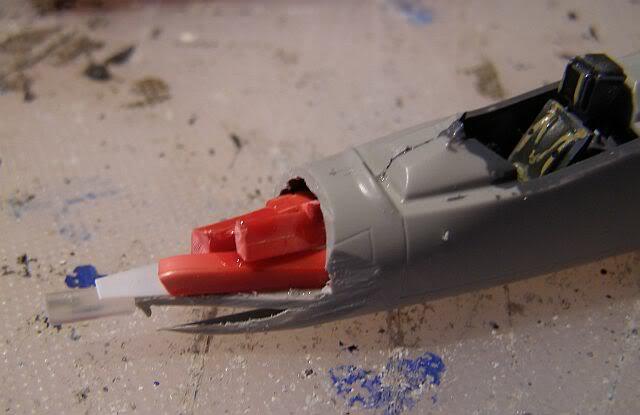 The main changes will be to crop and rebuild the nose, remove the parachute/ECM box and reshape the tailpipe area, plus some minor changes around and about. Fortunately Italeri got the cockpit wrong for a 100 Series, so no changes required there. Large box removed from tail and space filled (with plastic card and part of a coffee stirring stick). Large Nose chopped off. 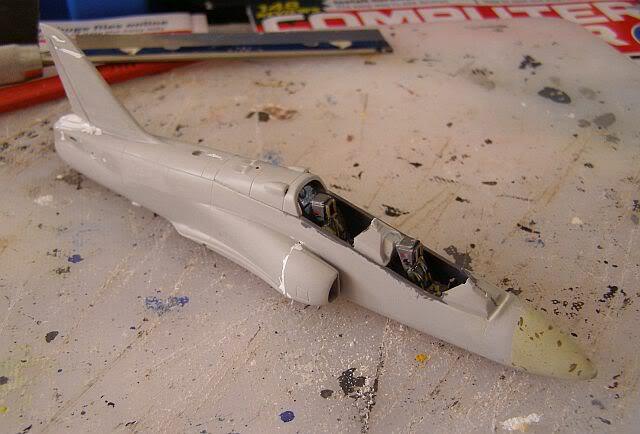 The undercarriage bay has been used as a marker for the correct length and my older Airfix Hawk is being used as the template. The new nose is sanded to shape. Note that my tube of Milliput really has reached the end of its life (its full of dark flecks). 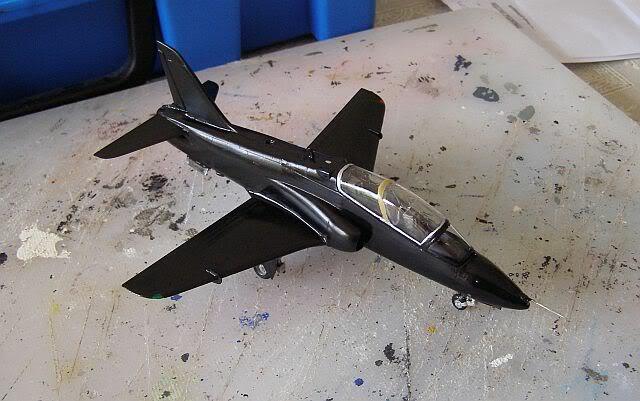 A coat of Humbrol 85 Satin Black is applied, partly to reveal any imperfections that will need to be re-done. For the most part they are superb; finely printed, accurate (as far as I can tell) in detail and colour, and nicely thin. It looks as though they are the equivalent 1/48 artwork scaled down to 1/72 - you can tell because the writing and numbering is almost unreadably small ! There are a few snurglies though, including the unreadable numbers (which could just be my ageing eyesight). 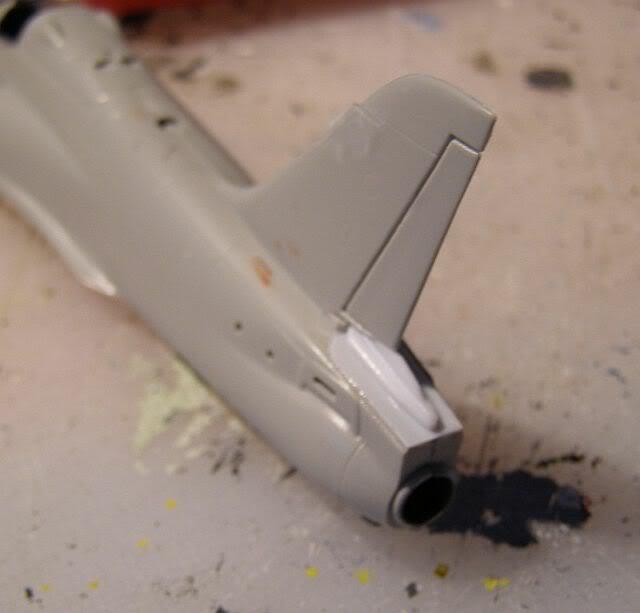 As a general point the decals are quite thin and their glue is very effective; this means that you really need to place some of them very accurately first time, as subsequent moving is not easy. Much as I suspected when I opened the packet, the tail decal is not an exact fit to the tail (I guess this is probably due to unavoidable printing limitations), so you need to trim it. 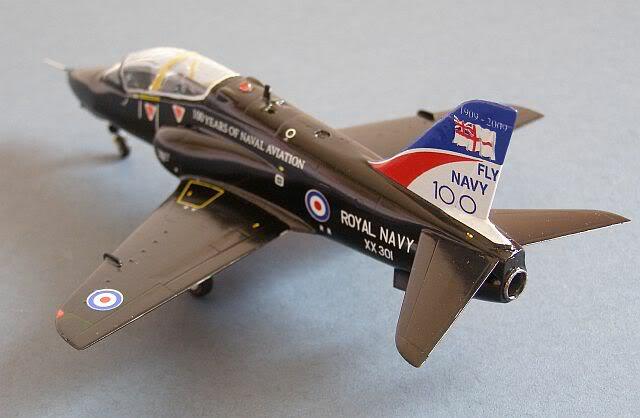 However this is not an easy job as it seems to be slightly too large and trimming to fit threatens to remove either the "Fly Navy" lettering at the back, or the red/white/blue conjunction at the front. I think I have managed, but it was a very fiddly job. You then have the problem of tidying up the edges once it is dry, although in the end, they did settle down very well (I curled the "edges" over and applied a little Humbrol Decalfix to them) such that I didn't need to do any touching up afterward, although I did use part of the spare white decal provided, to cover a gap just above the tailpipe. Four decals (nos 66x4) seems to be missing. This is a pity as they are the ejector seat triangles, which are the large red and white variety. 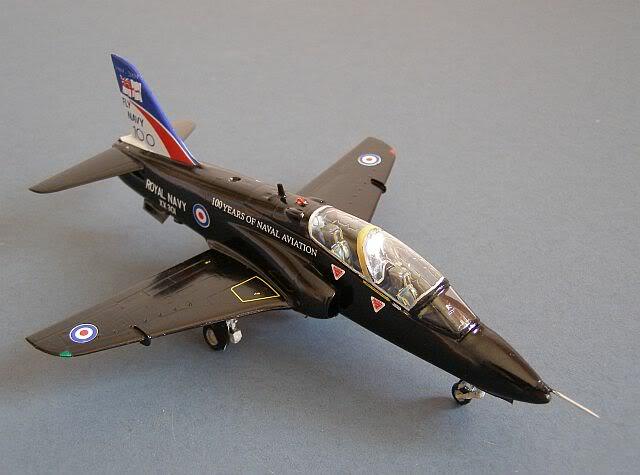 Fortunately, last month's Canberra had some suitable replacements. The biggest problem though, is the roundels, which have a fine white outer ring. The red centres are provided as separate decals (hurrah! ), but the white outer rings are not. Predictably (again due to printing limitations), these are slightly off centre, and it is very obvious. 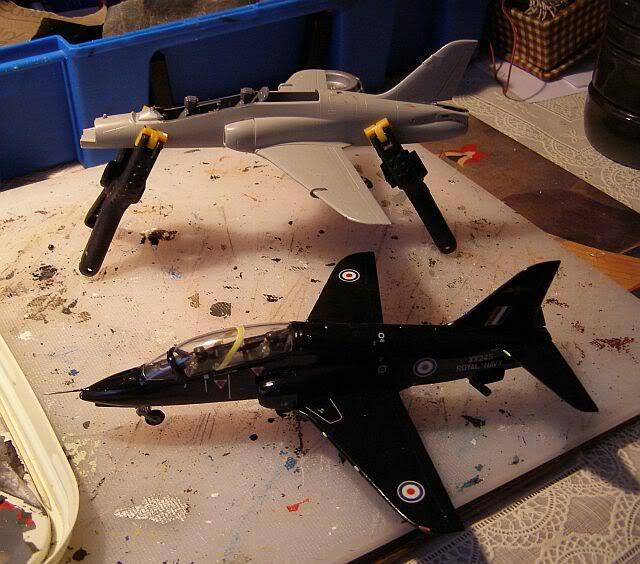 Compare this with the Model Art decals used on my earlier RN Hawk (which were 3 part) and went together perfectly. I really think that decal printers everywhere need to take this lesson onboard - for want of 6 simple separate white circles, I will now have to source some replacements elsewhere. However, overall, at the low price A2Zee is charging, I would still strongly recommend this set, but the missing decals and off-centre roundels are disappointing. 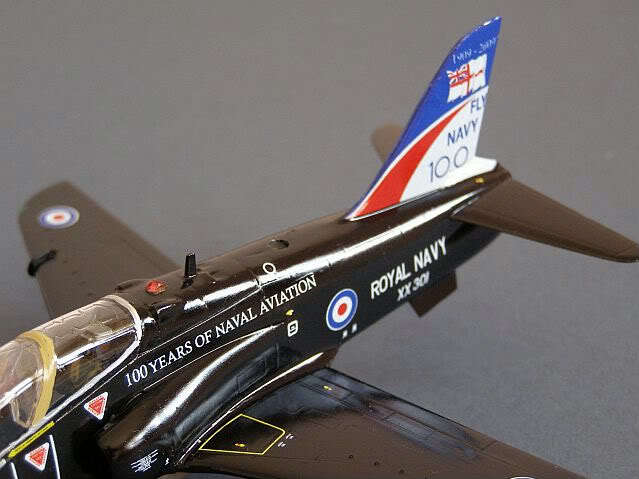 And finally, with the decals on, plus 3 top coats of Klear to give a suitably gloss finish: 100 Years of Naval Aviation!